Thread is a flow of control within a program. A thread is similar to the more familiar notion of a process, except that multiple threads within the same application share much of the same state--in particular, they run in the same address space. It's not unlike a golf course, which can be used by many players at the same time. Sharing the same address space means that threads share instance variables, but not local variables, just like players share the golf course, but not personal things like clubs and balls. A thread goes through various stages in its life cycle. For example, a thread is born, started, runs, and then dies. Following diagram shows complete life cycle of a thread. New: A new thread begins its life cycle in the new state. It remains in this state until the program starts the thread. It is also referred to as a born thread. Runnable: After a newly born thread is started, the thread becomes runnable. A thread in this state is considered to be executing its task. Waiting: Sometimes a thread transitions to the waiting state while the thread waits for another thread to perform a task.A thread transitions back to the runnable state only when another thread signals the waiting thread to continue executing. Timed waiting: A runnable thread can enter the timed waiting state for a specified interval of time. A thread in this state transitions back to the runnable state when that time interval expires or when the event it is waiting for occurs. Terminated: A runnable thread enters the terminated state when it completes its task or otherwise terminates. 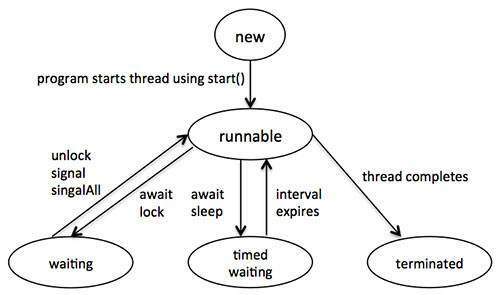 Every Java thread has a priority that helps the operating system determine the order in which threads are scheduled. Java priorities are in the range between MIN_PRIORITY (a constant of 1) and MAX_PRIORITY (a constant of 10). By default, every thread is given priority NORM_PRIORITY (a constant of 5). Threads with higher priority are more important to a program and should be allocated processor time before lower-priority threads. However, thread priorities cannot guarantee the order in which threads execute and very much platform dependentant. You can extend the Thread class, itself. Here threadOb is an instance of a class that implements the Runnable interface and the name of the new thread is specified by threadName. // This is the entry point for the second thread. The second way to create a thread is to create a new class that extends Thread, and then to create an instance of that class. The extending class must override the run( ) method, which is the entry point for the new thread. It must also call start( ) to begin execution of the new thread.